We have absolutely become a gadget-obsessed society! It started way back with heart-rate monitors, then GPSs, and now anyone who is the least bit active has some sort of a step tracker on. In the triathlon world, we have upped the ante . What started with simple GPS tracking, moved on to measuring power output for biking. We have now moved on to new frontiers, such as power-based running, and even started to look at measuring lactate in the blood with passive devices. How many inputs do we need to maximize fitness? In this blog post, I will take a peak into some of these methods for measuring output, and describe how they can be used. Heart-rate monitoring is the most basic form of measurement these days. 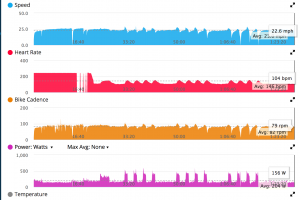 Not many avid athletes perform any workouts without having a heart-rate monitor on. Some athletes measure their heart rate, but don’t use the data. Others perform tests to learn their heart-rate performance zones, and use these zones to guide their workouts. Heart rate is a good indicator of effort, arguably better than RPE – rate of perceived exertion. The people who train using power will tell you that heart rate is too easily influenced by other factors, such as hydration, environmental factors, and nutrition, and is not as pure of a measurement as measuring power output. Cyclist have been training using power for quite a while. Various devices are used to measure the output of the cycling power. Cycling power is typically measure using strain gauges, placed on key parts of the bike, such as hubs, pedals, crank arms, and chainrings. I even saw a device advertised that claimed to measure power based on a device installed on the valve stem! The theory behind using power to train and race on the bike is to first establish a value for your FTP, which is your Functional Threshold Power. This number, measured in Watts, is (in theory) the amount of power you can maintain for an hour. There are several ways to test and establish your FTP. Once you have this number, all of your training is done based on a percentage of your FTP. Having this number is also very valuable for measuring your output for racing. Staying within certain power ranges allows you to put out enough power to ensure your bets bike split, but not so much that you have nothing left for the run portion of your triathlon. Speaking of Best Bike Splits, there is a company, called Best Bike Splits, that will take your FTP and several other numbers, and give you a segment-by-segment guide to ensuring your fastest bike split by telling you how much power you should be producing at each stage of your race. Since bike power has been around for a while, all the popular sporting devices can display a ton of different power metrics. When I ride, I like to display the average power for my current lap or interval, as well as my average 3-second power. This helps closely monitor my power output for both training and racing. Much newer to the scene than biking power is running power. Several companies have come up with devices used to measure your running power. Stryd originally had a device that measure power from a chest-mounted pod, and has since moved to a foot pod. RPM2 makes a footpad-based power meter that goes in the foot-bed of your shoe. One of the guys that works for Stryd (Jim Vance) wrote a book called “Run with Power” that outlines the principles of running with power, and how it can help the measurement and performance of your run. All the concepts of training and racing with power from the bike can also be used for running power. There are tests to measure your running FTP and you can then use these numbers to apply the correct amount of power to your run. Here is where the problem is. Since running with power is quite new, the number of devices able to display the run power data are very limited. Garmin has done a great job with open APIs to their devices, and Stryd has done some work with them, but today the display of data is not nearly as useful as what can be displayed for bike power. As an example, if you have a Garmin 920XT, you can display instant running power, but not average running power. This allows you to see what your exact running power is at any moment, but doesn’t help you temper it over the course of a lap or interval. Since Stryd is a small and nimble company, they have been great about taking feedback and are in the process of trying to add the features needed to make this useful. Until this is done, I’m afraid making run power useful is going to be difficult. The measurement of data is only getting more intense! A Massachusetts-based company called Humon is making a wearable device that uses infrared technology to measure the makeup of the blood in your leg, and will be able to tell you in real time if you are reaching and exceeding your thresholds. The data available to athletes is growing at an alarming rate. People who love data can wear enough devices and have enough measurement to produces pages and pages of charts and graphs. Some of this data can be extremely useful for training and racing, but too much data has the possibility of distracting against the work that needs to be done to improve our fitness. At the end of the day, these gadgets can provide tons of measurements, but we still need to put in the work!